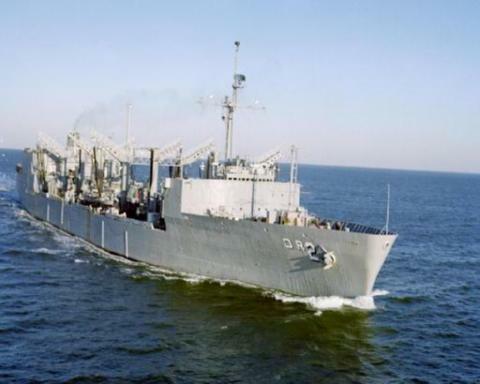 The USS MILWAUKEE (AOR-2), a Wichita-class replenishment oiler, was commissioned on 1 NOV 1969. Built by General Dynamics Corporation at Quincy, Massachusetts, USS MILWAUKEE was initial an Atlantic Fleet "Oiler" deployed to the Mediterranean, North Atlantic and Caribbean, before being called to the "West Pac" and duty off Vietnam in 1972-73. Returning to Atlantic Fleet in 1974, MILWAUKEE finished her service career, true to the acronym "A.O.R. - Always Out Replenishing". USS MILWAUKEE served her country for 24 years, 2 months and 26 days, until decommissioned on 27 JAN 1994. USS MILWAUKEE was laid up at the NISMF in Philadelphia, PA for fifteen years after decommissioning, then sold for scrapping in 2009. The fourth Milwaukee (AOR‑2) was laid down 29 November 1966 by General Dynamics Corp., Quincy Yard, Quincy, Mass. ; launching scheduled 3 January 1970, to be sponsored by Mrs. Henry Haier, wife of the Mayor of Milwaukee. Milwaukee (AOR‑2) is the second of a new class of multipurpose replenishment ships being constructed for the Navy. Once in commission, she will operate independently or as a unit of a fast underway replenishment task group. Cargo space and underway transfer equipment is provided for petroleum products, refrigerated and special weapons. She carries the most advanced fueling‑at‑sea equipment and has a rapid cargo discharge capability enhanced by a landing‑launching area for a replenishment helicopter.